The golfing season is fairly short, May to early October, depending on snow cover. (The golf courses at Radium Hot Springs and Golden are the first to open each spring.) But with the long days of summer, there’s plenty of time for golfing. Greens fees range from $15 at the historic nine-hole Nordegg Golf Course to $225 for 18 holes at the Banff course. At the resort courses, greens fees usually include the use of practice facilities and a cart (complete with global positioning system at Silvertip). The sport’s popularity in the mountains is such that tee times need to booked well in advance—up to a month for prime times at some courses. The jewel in the golfing crown is the Fairmont Banff Springs Golf Course, a 27-hole layout that graces the grounds of the Fairmont Banff Springs and is rated one of the world’s most scenic courses. The Fairmont Jasper Park Lodge Golf Course, a challenging par-73 course surrounded by spectacular mountain scenery, is of the same high standard. 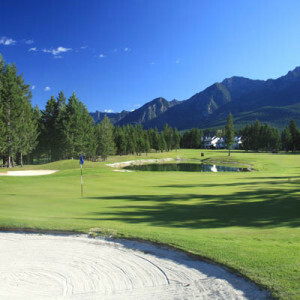 At Canmore, Silvertip set a new standard in golf course difficulty in Canada when it opened in 1998. It promotes itself as an extreme experience, and it is: 7,300 yards long, with elevation changes up to 40 meters (130 feet) on any one hole, and a slope rating of 153–the highest of any Canadian course. Across the valley from Silvertip, Stewart Creek opened in the summer of 2000, bringing the total number of courses in Canmore to three. Other resort courses are Radium Resort (36 holes), at Radium Hot Springs; Greywolf, at Panorama Mountain Village; and Wintergreen, at Bragg Creek, while the towns of Canmore and Golden offer excellent 18-hole public layouts, as does Waterton Lakes National Park. One of the region’s premier courses, the 36-hole Kananaskis Country Golf Course, was destroyed by flooding in June 2013 and is scheduled to reopen in 2017. To read more about the history of the course and flood details click here.